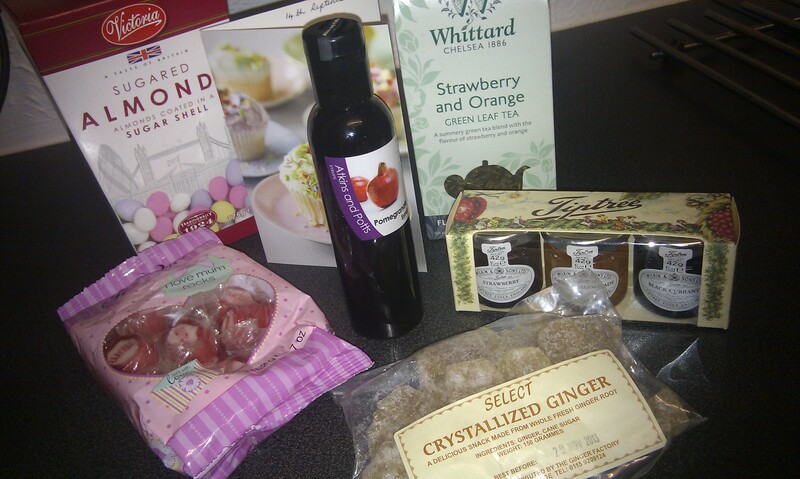 Last month I joined the Foodie Pen Pal group which matches you up to a person to send a parcel of food and treats that you think that person may enjoy and in return you are sent a parcel from your Foodie Pen Pal. Although I am a little late in posting, this is what I received from my Foodie Pen Pal Angela. Unfortunately I don’t think she has a blog so I can’t put a link to her but I wanted to say thank you for the things I received. She sent some lovely jams (which I have already enjoyed on toast for breakfast), fruit tea, crystalized ginger, some sugar almonds (which are actually a favourite of mine and in her note says they are given to pregnant ladies for luck) and some lovely sweets which I will be packing into my maternity hospital bag. It has been a nice thing to do and maybe again in the future when things have settled down with the baby then I will sign up. If anyone ever fancies having a go then you can sign up here: http://www.theleangreenbean.com/ You don’t have to have a blog to do it! Its quite fun and interesting to do.